I have a 2008 SL550 with possible front tire wear issues. I average about 8,000 miles per set - I do not drive hard and the alignment is near perfect. I bought the car with custom 20" wheels and I was told the tires were so wide, the tires wore quicker than OEM. After two sets in about 12k miles, I bought new rims to match OEM specs. These Michelin tires, even with a 50k warranty, average about 8k miles. The MB dealership and tire companies all state that it's due to the camber, these tires wear fast, etc. But, I am hard pressed to locate people saying they're changing front tires around 8k miles. Plus, it seems that the MB dealership and tire companies can't really say they have people bringing up the wear and can't really state anyone has asked why their tires last under a year. Is this normal? And are all sports cars this way - other MB models, BMW, corvette, etc.? Our results are markedly different: 2007 SL550 ... I have gotten about 30,000 miles out of rear tires (Michelin Sports A/S3) and 36,000 out of front tires. Are you confident in the correctness of your car's alignment, toe, camber, caster, and tire pressure numbers? 8000 miles ... that isn't normal. Good luck, Mate. Thank you heatwave. Both the dealership and tire center stated it was in specs. I'll ask around again. The rear tires hardly show wear, so that I'm confident in those are good. 8k is not normal for sure. But you did not specify - do you drive your car on the public roads or you're racing it on the race track? That makes a huge difference. Another question - was your vehicle ever involved in an accident? I know a guy who, after fixed his car from a collision, could never fix that - his tires would worn out in under 10k. Since you're talking about the front tires - if you're not racing the car nor corner at speeds above recommended, this is very unusual. My best idea would be for you to drive around town or see maybe someone knows an real expert in car suspension who could guide you in the right direction. Not necessary an SL expert, any suspension expert, so you could have a start. Because this is out of the usual problem where just one thing or part might be bad. Someone experienced with alignment should be able to look at the wear pattern on the tires and tell if there is a alignment issue. Outer edge wear, inner edge wear and feathering in certain areas give a clue as to what is going on. Are they wearing evenly across the whole tire or only in certain places? DO POINT OUT THERE IS ONLY FRONT AND REAR “TOE” ADJUSTMENT OEM! WE SAW THE NEED THEREFORE TO MANUFACTURE AND REINSTATE FROM THE EARLY 90’S PRECISELY ADJUSTABLE (SINGLE WRENCH, ON CAR) FRONT CAMBER AND CASTER AND REAR CAMBER (WITH EXTRA TOE) KITS. 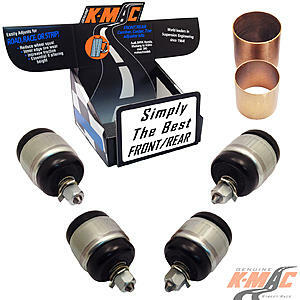 NO MODIFICATIONS – SIMPLY REPLACE THE 4 FRONT AND 4 REAR HIGHEST WEARING BUSHINGS. ALLOWING “ONGOING FULL ADJUSTMENT” TO FIX IT RIGHT THE 1ST TIME! ESSENTIAL IF WORN BUSHINGS, ALTERING SUSPENSION HEIGHT, LOAD CARRYING, FITTING WIDE PROFILE TIRES AND/OR CAPABILITY TO RETURN TO FACTORY SPECS AFTER CURB KNOCK DAMAGE. CAMBER – Allows to actually change the tire contact angle resolving costly, premature edge tire wear, improving traction/understeer/oversteer (TOE only alters wheel direction). CASTER – Correctly resolves steering pull, increases steering response. With better turn in and high speed directional control, along with improved anti dive/lift under brake and acceleration. No more ongoing trips to dealers or alignment shops or constantly changing tire brands because of Toe only adjustment OEM. Or the frustration of installing (Front only) ‘offset’ bolts – to find they are inaccurate one only position – offering a minimal .3 of one degree! We have changed all that. Up to 4 times the adjustment range of these “one” position bolts. With single wrench precise adjustment and importantly - on car accurately (under load) direct on alignment rack! 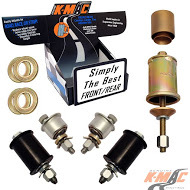 This K-MAC patented design breakthrough of on car adjustment has also eliminated the need over the last 40 or so years of time consuming disassembly each time to change settings. Front bushings have twice the load bearing area of OEM. Yet still 2 axis/self aligning without the use of oil and air voids. Allowing also improved brake and steering response. Rear bushings provide precise Camber for the first time and extra Toe to compensate for the new Camber facility. Both front and rear kits come with instructions and bush extraction and insertion tubes. MB World members (USA/Canada) delivery $30 one kit or $40 front and rear. Can pay by PayPal or call our toll free number 1888 414 0762 to quote Visa or MasterCard. Only normal Street driving, no track racing. Rear tires wear even, fronts only wear on the inside, almost as if the car was only riding on the inside 2 inches of the tires. The other 7/8 of the tires have all liked great, like they'd last 30k miles. That's why I always thought it was an alignment problem, yet neither the MB dealer and two alignment shops say it's within specs. I bought the car from the MB dealer and the report did not state any accidents. Again, thanks for all the input and info! Also check for worn lower control arm bushings, and any bad ***** joints. These can settle during alignment, but move under load, causing misalignment and wear. Lower control arm bushings do not last past 60K miles. +1 Our heavy cars are tough on front end components. Just curious, has the car been lowered by chance? The car has not been lowered. Other than the custom rims when I bought the car, which have been replaced with standard sized rims, everything else is factory. I'm still scratching my head as to what is going on. Our cars do have aggressive camber, but the wear you are seeing is unusual. I have run high performance summer tires on my SL for years. I don't expect more than 10k to 15k on the tires. That said, i always get at least 15k on the front. The rear tires wear out first. I always replace 4 tires at a time and the fronts typically have 20 to 30% tread left when I do change out to a new set. I'm having exactly the same issue with my 2007 clk550. The inner and outer wear on front tires and I replace them every year. While I don't have this issue on the rear ones. Were you able to fix this issue? I have everything original on my car and it's not reported having been in an accident either. As stated earlier, camber is only adjustable by about 0.3 degrees on an R230 on the front, and no adjustment on the rear. They are probably only measuring toe, and it's probably within spec. Mine wear really quick also. I will be getting adjustable upper control arms for mine real soon. The cost is less than another set of tires and they can easily be set back the factory spec of 1 degree if you want it to corner like it's on rails, or set it to zero if you'de like the tires to last a lot longer. I'll be setting mne to zero for tire life as it's a boulevard cruiser, not a race car. These control arms will pay for themselves on the first set of tires that don't wear out at 8,000 miles. Inner AND outer wear is generally a result of the tire pressure being too low resulting in the tire wanting to cup in the middle of the tread. Raise you're front air pressure just a touch and see if that helps. If both tires are wearing both inside and out, then as Blazeracer said, that tens to indicate improper (low) inflation. Do you have custom wheels or OE? If you have custom wheels, then that is likely the issue and you'll have to decide to either live with it or go back to OE wheels. The only other case where I have seen both front tires wear both inner and outer edges is when the steering rack or tie rods are loose allowing the tires to chatter. But that should be discovered during the alignment check unless the tech is just very careless. After searching, buying factory rims, standard sized tires, and running them for a while, in the end the MB dealership finally stated/admitted the car had been lowered prior to purchasing the vehicle from them. When I was running the car at the factory suspension height, it was a few inches too low and wore the tires on the insides. I had to run the car at the highest setting, which was the normal setting, but that setting was still not at factory specs - hope that makes sense. Through a long explanation, due to the car being lowered, it wore heavy on the insides of the front tires and somewhat on the rear tires. I wasn't too happy since I purchased the car as a 'pre-certified' vehicle. They did try to 'fix' the problem, and never charged me anything as they tried.... however the damage had been done and the suspension was starting to fail. Sorry this isn't much help. How do you determine if car was lowered or not? What needs to be measured? The only way I found out was the service tech at the dealership noticed the car was very low after I purchased new rims and tires. He thought the suspension was leaking air and realized that the system had been changed...or something. I don't exactly recall as it was over 2 years ago. I only remember the service manager having a long explanation as to why they didn't notice it before (due to wider than non-factory rims/tires) and why their 'top tech' figured it out after I brought it in again. Seems all convenient to me as the extended warranty had just ended..... But, they did make good on trying their best to fix it all under the warranty. After comparing pictures of how my car sat at low and high versus other models of the same year, it was a lot lower. I presume your dealer will know what your normal clearance should be. I would then compare that to your car. Trickle charge - which battery?